The Great Debate | 2P START! Fellow webcomic creator, Ryan Estrada honored us with a request to do a guest strip this week. When he asked us (a few months ago), we were pleased to get a week off, honored that HE would come to US, and worried due to the nature of his request. See, Ryan was planning on doing ONE HUNDRED guest strips on this very same day all around the web! While he didn’t quite make it to that number, he got pretty darn close. In fact, he has more comics published in one day than we do in a year (almost as many as we’ve done EVER)! So be impressed, and try to go out and find as many of his other beautiful strips on your other favorite webcomics! BUT WAIT! THERE’S MORE! Yes, that’s right, D3vin has graced us with a second guest strip this week, so check it out! I was a bit confused at first, but he did a great job! I love how princess mentions she’s a POW. Great Comic! I’m pretty sure you met The King Of The Mushroom Kingdom in Super Mario RPG, but it has been a few years since I last played that one so I could be wrong. Nice try, but everyone knows that, “Mushroom Kingdom government is ruled by a chancellor and the mushroom retainers”. So says the all knowing wiki. It isn’t his name is Koopa, and his running mate is Kong. Mario’s name is not Mario Peach, it’s Mario Mario (strange, but this is true). Oh you’re right Dan, it was the Chancellor you met in Super Mario RPG, not a king. 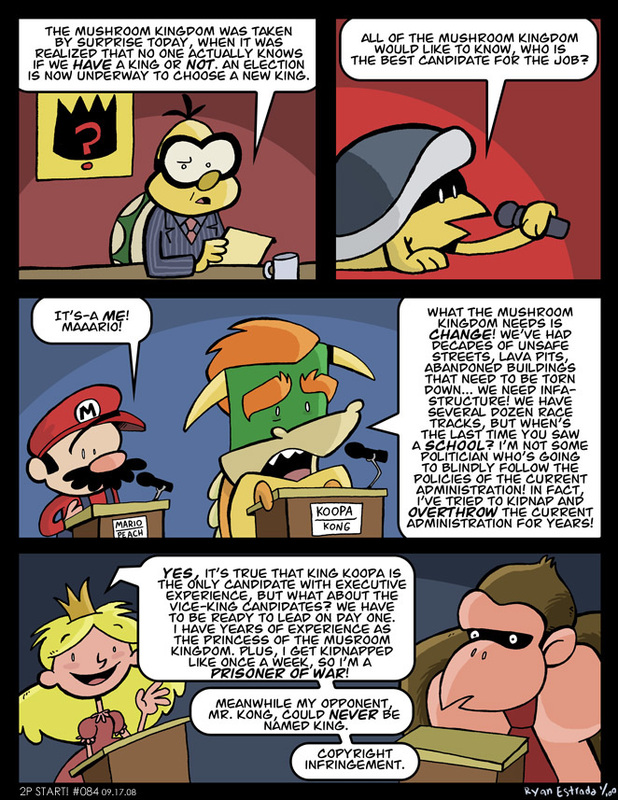 Also, that lable isn’t saying Bowser’s name is “Koopa Kong”; it is “Koopa/Kong”, like “McCain/Palin” or “Obama/Biden”. That makes sense. But why would Kong be crowned King – there is only one king! And Kudos to Mr. Estrada for his endeavour! But I think I remember there was a king, In the cartoon or comic they created a king.. or was it Chancellor? Actually, I’m pretty sure that’s not true. As far as I know, no game ever says that Mario has a last name, and the only thing that names him “Mario Mario” is the movie, which doesn’t count. Also, I have a bookmark with a clip of somebody (I forget who) being asked about the last names from back when the game came out, and he says they don’t have any. I’m at work right now, but I can find the link when I get home. Damn, Estrada was busy. Two guest strips (that I saw) posted this week. Actually, I’m pretty sure that’s not true. As far as I know, no game ever says that Mario has a last name, and the only thing that names him “Mario Mario” is the movie, which doesn’t count. I believe this comes from “The Mario Brothers”, like how two brothers with a last name of “Smith” are “The Smith Brothers”. Thus, Their names would be Mario Mario and Luigi Mario. Twas an excellent comic. I would just like to point out that the name and character of “King Kong” is actually in the public domain. Nintendo was sued when the original Donkey Kong came out in the arcades by MCA Universal, but won the lawsuit by showing that King Kong was over 50 years old and thus in the public domain. Still, it was a good punchline. True, but again, it hasn’t been officially said that “Mario” is their last name. “The Mario Bros.” could just be how they are known as a pair. Like, for example, “Steve Miller Band” isn’t a band made up of a bunch of people named Steve Miller, that’s just what they call themselves. She’s princess of the Musroom Kingdom? Something missing there? First boring comic in a while. ha, So Bowser was the good guy all along! haha i think that bowsers right and also that the last comic was a killer! this is a great comic and no offense ray this guest strip was better than what you usually do. NCR! (Nice comic Ryan!) I feel like I’ve seen this style before. Anyway, great art and great joke! Also, why are they electing a king? Why is Peach still a princess, shouldn’t she be the queen…unless her parents are still alive…or she’s under 18! Because the kingdom is fresh out of watery tarts to lob scimitars at people…. Don’t you need to be married to be a Queen? Who says Bowser = Obama? Both candidates talk about change. And Koopa’s talking about being a Maverick! (I shouldn’t have cut the maverick line…) No one is supposed to “be” anyone else. I was just using the language of the current election. This style looks so familar… Have you posted any comics anywhere else, Ryan? jajaja, thats a good comic, “copyright infringement”. I love your comics since first time i saw this website. Ryan, Bowser sounds more like Barack Obama to some readers because he is attacking the incumbent administration, regardless of the “change” lines. Also, I thought it was particularly funny – and of course, intentional – how Peach is dismissing Bowser’s executive experience, when it is Sarah Palin who holds that distinction. Of course you couldn’t perfectly assign every candidate to every Nintendo character, but it is understandable that Bowser might correlate more strongly with Obama than any other candidate. BTW, I say we make Nader into Klepto. The “Mr. Kong” punchline was brilliant. Nice job. Actually, there is no copyright on the name King Kong. Anyone can use it. I sound nitpicky, but I’m just saying. damnit! I meant to also say: What? King K. Rool isn’t qualified?